This is the 400 g-ton centrifuge used for geotechnical and structural model studies at the University of Colorado School of Engineering. The rotating arm had not yet been installed. When constructed, this was was one of the largest facilities of its kind in the world. 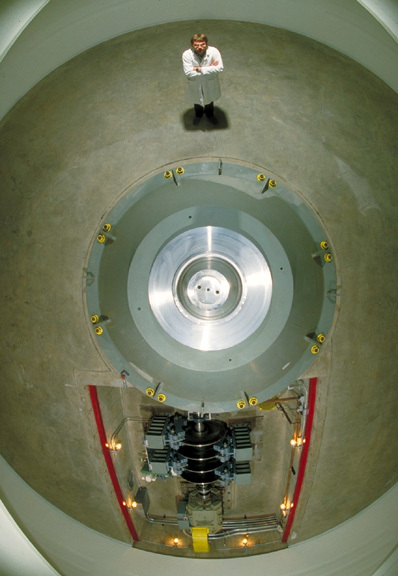 More info at http://ceae.colorado.edu/geotech/facilities_centrifuge_400gton.html . This is actually the larger, 400 g-ton centrifuge. I’ve crawled down in that motor pit many times to replace shear pins. You are right! Thanks for pointing that out. I have corrected the text and the link to the CU Civil Engineering site. Were you a grad student there, and have moved on to bigger and better things now?